Tami has worked in the beauty industry since 1995 and with S-kape as a stylist/educator since 2002. Tami specializes in smoothing services, curly hair, and fun contemporary edgy styles. Tami’s guests love her beautiful friendly energy and being pampered. 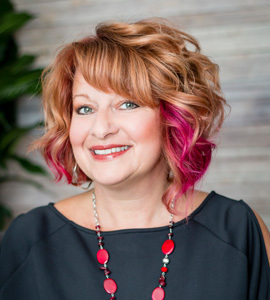 “If you like fun and edgy styles and colors, and to switch it up a lot, I am the stylist for you.” When Tami is not at the salon she enjoys, decorating, gardening, and spoiling her nephew and four little fur babies. Tami serves guests Monday 1-9, and Tuesday-Thursday 8:45-2:30. She is an educator and works as a team with an associate.